My informant tells me this story of a teenage girl in Japan who drew a drawing Japan shortly before she committed suicide. The story and drawing went viral in Asia. 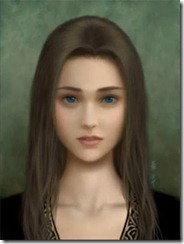 In the forums online, it is said that you can see the girl’s sadness in the eyes of the girl in the picture. Forums warn against staring into the girls eyes for longer than 5 minutes, telling me that people have committed suicide after doing it. According to my informant, people say the picture changes,as you view it there is a hint of a growing taunting smirk appearing on the girls lips or a dark ring grows around the girl or her eyes. Informant: Not really… I don’t think they did. But it’s a freaky story, so I don’t know. Analysis: Through my research, I could not find any solid news articles to support the claim that people have committed suicide after looking at this drawing, though many people claim there are hundreds. Furthermore, I found some forum posts that claim a video-game designer in Japan was the real artist of the portrait and that he was still alive and well. Some forum posts claim that because the image has a blurry quality to it, if you stare at it for too long, your vision will get blurry as well and you are under the illusion that the picture is changing before your eyes. This also has to do with the image being seen on a digital screen. Because of the context of the story and the atmosphere in which it is often read, this will help induce fear and influence a person’s response. This most likely is an elaborate internet hoax, much like a chain email letter. People enjoy being scared because it provides an adrenaline rush which can be extremely addicting. My informant is 23, Korean-American, and currently studying at USC (expected graduation 2013). She first saw the picture and heard the story when she was in high school, approximately 16 years of age. The informant is a friend from high school. He originally created the expression “girl with the look” on one of the first days of senior year when he saw a girl he was very attracted to. He didn’t know her name so he just called her the girl with the look. The expression quickly became a kind of inside joke within our friend group and rather than ask each other who we were interested in at school, we might ask who each other’s girl with the look was. The expression expanded out a little and other people at our school started using it, too. Another variant is “girl with a look” meaning simply a girl you’re attracted to, whereas “girl with the look” implies infatuation at first sight almost. For girls and gay guys, “guy with the look” also became a thing, though it was never used as much. My informant liked the expression because it was a way to refer to someone without using a name, which kept it kind of secret and exclusive to those that knew what was being talked about. It kept the discussion within the friend group and also bonded us together by having our own phrase. I like it for the same reasons. Because it started out in one group, it created a sense of community and exclusivity within the group. And even though it’s a new piece of folklore, it did grow to have multiplicity and variation. This piece of folklore is something that is widely known across the country, if not the entire world. My informant is a pregnant woman, and works and lives in the Los Angeles area. When asking her about folk practices that she takes part in regarding her baby during pregnancy, she said that she is waiting to find out whether it is a boy or a girl so she can find out whether to paint the baby’s room pink or blue, get it pink or blue blankets, or get it pink or blue clothing. When I asked my informant where she got this notion of baby boys being ‘blue’ and baby girls being ‘pink’, she simply said “it’s everywhere”. We all have grown up in a society where that’s just how it is. Popular culture, magazines, movies, and more all exhibit that this is just how it is and how it’s always been. “The other day”, she said “I was watching the sequel to Father of the Bride”, and they were creating the baby’s room. She was going to be a girl, and they showed the room and it was “all pink, pink walls, pink furniture, pink stuffed animals, pink everything!” she said. It got her thinking about it, and solidified the fact that she would have to do this for her child if she wanted it to have a ‘normal upbringing’. When I asked her how she believed that this notion and tradition started, she just said that it’s probably in human nature. Blue looks like a more masculine color, and obviously, pink is feminine she said. When I asked her why blue and pink rather than any other colors, she said that she wasn’t sure. “Maybe they’re just the most inherently masculine and feminine colors” she said. I believe that this tradition started because, like my informant said, blue and pink are the most inherently masculine and feminine colors there are. I remember reading of a study saying that men are more naturally attracted to blue, while women are more attracted to pink. I believe that this tradition stuck on, and is now a big part of our popular culture and traditions of a baby. Annotation: Father of The Bride Part II (1995), Movie.